This page last revised September 2, 2015. September is turning out to be an exciting month! The first Flash Sale of the month now includes HostGator’s latest and greatest offering, WordPress Hosting. You can take advantage of this sale the 2nd of September from 8:00am to 10:59am CST. This flash sale will be providing a 60% off discount on new hosting packages AND new WordPress Hosting packages. 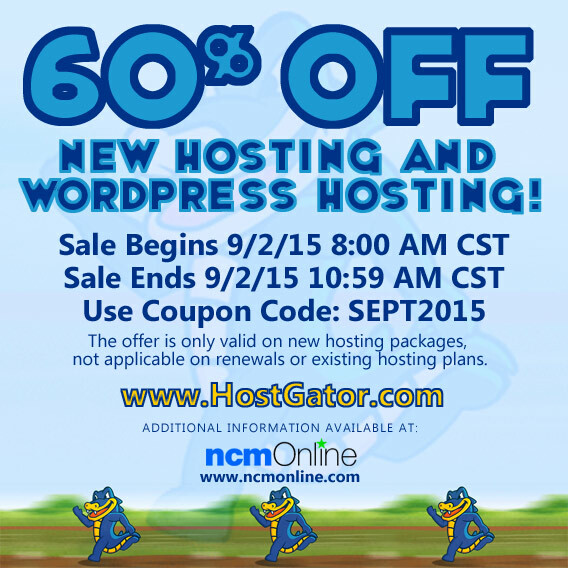 Shop now and receive 60% off any new HostGator web hosting or WordPress hosting package. Use promo code SEPT2015 in your cart when you order. Sale Begins: Wednesday, September 2nd at 8:00 AM CST. Sale Ends: Wednesday, September 2nd at 10:59 AM CST. Current HostGator customers are welcome to join in and take advantage of this great offer; however, the offer is only applicable to newly created hosting packages. That means the discount does not apply to extensions, renewals or upgrades of existing hosting packages. Please note that your existing hosting package cannot be canceled and transferred to a new package in order to receive the discount. If this occurs, you will be billed retroactively for the discounted amount. All coupons and discounts are only valid towards the initial purchase and do not affect the renewal or recurring price. The discount offered for domain names only applies to newly purchased domain names. It cannot be applied to renewals or transfers. PLEASE NOTE: While we attempt to provide timely and accurate information, any and all pricing, features, discounts, coupon codes, promo codes, etc. included on this page are beyond the control of ncmonline.com and are subject to change without prior notice. Certain elements of this page: Copyright © 2015 HostGator.com. All Rights Reserved. ©2016 NCMOnline.com. All rights reserved.